My over nine-year long project has come to an end and the result is an astounding encyclopedia of over 4.000 entries carefully researched for meaning, changes through the years, and origins. The original volume was selected to be included in public and college libraries across America, been used as a reference for a Doctorate Thesis at a major University, used to teach English as a second language and praised by professors, authors, editors, newspaper writers and many others. They have sold in at least 7 countries around the world. Now you can own your own set at a discount, or give it to someone interested in the history and progress of the English language. Special offer on signed book set! 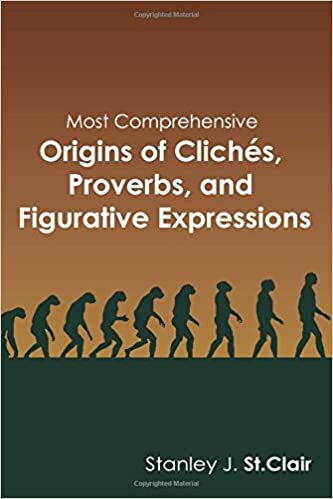 When I published the first volume of Most Comprehensive Origins of Cliches, Proverbs and Figurative Expressions it was my hope that it would become a standard bearer in its genre for people to discover new truths about the fascinating English language. I am happy to say that it has. On a regular basis I hear or read new reports of how the book is used. A minister said that it helped him in preparation of his sermons, and in his opinion was the best book every published of its type. A school teacher said that it was great for helping with students, and it has been praised by numerous authors. About a week ago I heard a head librarian on a radio talk show say that he kept his copy on his desk at the library and referred to it regularly. Then about a day later I saw a thesis on line which had been written by a PHD student at Vanderbilt University to obtain her doctorate which quoted this book. The thesis was approved. Just this morning I saw a new review on Amazon.com by a man who, as a newspaper writer, gave a copy of two books to a Ukranian student to help him learn English. This book was one of those two. He, like 21 out of 24 reviewing it on Amazon, gave it 5 stars. Now my new book has barely hit the Internet. For those who enjoyed the first book, it is just as detailed and deeply researched as the first. For those who don’t have either, I have had my webmaster, Kent, place a special offer on the site for the books as a set at a special price. Those of you who read this and order this set from my site at stclairpublications.com will be receiving signed copies. I appreciate each of you very much! . My unique phrase origin book, Most Comprehensive Origins of Cliches, Proverbs and FIgurative Expressions was released originally in March, 2013, and the paperback version has been revised twice since then, adding about 100 new entries. It has been ordered by numerous libraries and has become a favorite of authors, ministers,teachers and public speakers, as well as countless everyday folk in seven countries where it has sold. It received remarkable reviews and praise from persons of all walks of life. It has 740 pages and delves deeper into the meanings, origins and changes of our everyday English expressions than any other book of its type. Check out the reviews on Amazon.com. Because sales this bookhave been so great over the past few weeks, I have decided to make a limited time offer to my blog readers who order directly from my website at stclairpublications.com by Monday, December 14. Whether ordering for a gift or a personal copy, each copy will be personally autographed with a note to the person requested. After placing your order, simply send me an email at stan@stclair.net telling me the name to use. Thank all of you for your interest in my work, and I wish you each a happy holiday season and a very prosperous 2016. Numerous individuals have purchased several copies of Most Comprehensive Origins of Cliches, Proverbs and Figurative Expressions for Christmas gifts. In many cases, people thought this was a “one size fits all” gift for family members. Think about it, with a good book you don’t have to worry about returns from a mis-fit if the person is interested in the subject matter! So, what I’m offering from now through Monday for friends wanting the perfect gift for their curious family members is that when they order four copies of this best-selling book they will automatically receive a fifth copy FREE! If you don’t have one, you can get yours free. If you have five that you don’t know what to buy for, you get one of the gifts free! But this only applies to orders from the St. Clair Publications website at http://stclairpublications.com, and only on orders placed today through MOnday, November 30, cyber Monday. I will personally handle each of these orders, so you are assured of getting your free copy without it even showing up on your order! Happy holidays to one and all! Oh, yes, and I’ll pay your shipping, only one $3.00 fee per order! St. Clair Publications has sold many thousands of books over the past six years since we opened up to publish other authors. These sales have been made through various channels: book signings, book stores and other retail outlets, our website at stclairpublications.com, Amazon sites worldwide and other online book retailers. Our books have been read and enjoyed by celebrities, best-selling authors, doctors, lawyers, public speakers, teachers and college professors and even at least one member of the British House of Lords. And of course, lots of average folks from every walk of life. We have even received compliments and endorsements by some very well-known individuals. Some folks have even ordered multiple copies of a title for gifts, particularly at Christmas. That thought brought on the idea that we should have a promotion this holiday season. Between now and December 20, anyone who orders a minimum of 5 units, each with a retail of $15.95 or more, from our website, no matter if they order all the same title or a combination of titles, will receive one additional book of his or her choice at no additional cost, and we will pay the postage with only a $3.00 service charge by us for the entire order! To select and receive your free book, simply email me your choice after making your order at stan@stclair.net. We have so many talented authors and such a variety of genres that at least one is sure to please everyone reading this blog entry. Click on our site at http://stclairpublications.com and go to authors on the left of the front page. And Happy Holidays to one and all! I want to give you a present for my birthday! I thought this would get a bit of attention. I’ve been very busy for the past just over a week, jotting about the map. I’ve ridden and/or driven nearly 2,000 miles and visited family, done research and attended a convention. I’d like to settle down to some rest, but that will be a problem still, since I have a club meeting tonight, have to meet with an author in another town in the morning, then have a three day club fundraising project. They say there is ‘no rest for either the weary or the wicked.’ I hope I fit the former, as I am truly weary at this time. But my birthday is coming up this Saturday and Rhonda has promised to take me out to dinner. I’m really looking forward to that! This year my birthday comes on the day of the week on which I was actually born–something which has not happened in years. I decided to offer an incentive to any of my friends and readers who will order one of my personal paperback books off of the St. Clair Publications website at http://stclairpublications.com by my birthday, this Saturday, August 17. These run from $9.00 to $27.95 retail. During my birthday week only, anyone who orders any of these books will receive a 20% rebate on the retail price. It will be paid either by PayPal or personal check after the order is received. All sales are secure, as they go through the PayPal system and you don’t even have to have a PayPal account. Simply go to the site and open an account if you don’t have one, then follow the directions. I hope I have a happy birthday and that you enjoy your read! And ‘happy refund’ to all of you! Be sure to email me at stan@stclair.net to let me know how to pay your rebate.